So, you’re heading to Mexico or Hawaii this spring break? Number one: we’re so jealous we can barely look at you. Number two: have you started your beauty prep? No one is saying you need to change anything about your appearance. In fact, if your idea of beach style is a raggedy old bikini and the straw hat you bought on your honeymoon, then you're our kind of people. But, if you want to be a little more tanned and groomed before you hit the beach, there are ways to do it and pitfalls to avoid. And if you do end up with straw-like hair and sunburn post-vacation, there are some easy ways to repair the damage before you return to reality. Sun can be hard on hair. It can fade colour or turn it brassy and make it dry. The wind and waves can also make it tangled and the sand leaves it grimy, leading to more frequent brushing that can cause breakage. Perhaps surprisingly, it’s water that’s the number-one enemy. She says that wearing a hat in the sun, and a swim cap in the water, is the best way to protect hair on vacation. You should also be careful with towel-drying and brushing. “Use a wide-tooth comb when hair is soaking wet to gently remove tangles before hair dries and loose tangles shrink up into a tight knot,” she says. Skip heat-styling tools, and apply leave-in conditioner before heading out. And if you do end up with fried green hair, Lynch recommends John Frieda Lemon Miracle Masque ($12.99 at select drug and mass retailers), which is targeted at blondes, but works just as well on all hair colours. “It has been formulated with BlondMend™ Technology, a triple repair blend of carboxylic acid, cationic conditioners and keratin. It softens fragile blonde hair by increasing elasticity in the hair cuticle. It helps mend the hair by filling in porous damaged areas caused by the stresses put on hair. And it helps strengthen and protect hair from damage and future stresses,” Lynch says. If you use a product that contains retinol and plan on sunbathing, give it a miss for a couple of weeks pre-vacation. “Retinol can make the skin sun-sensitive, leading to a greater risk for sunburn and dark spots. You can resume it as soon as you return, as long as you stay out of the sun while home,” says Chloe Smith, the national education and scientific communications lead at SkinCeuticals Canada. “However, there’s a bit of irony in this. If you are using retinol, it is typically to correct or prevent the signs of aging like wrinkles and dark spots. The sun is the number one cause of wrinkles and dark spots, so it would be best to avoid it altogether. If you can take precautions to minimize sun exposure like using and reapplying SPF 50+ and staying in the shade (read: no sunbathing! ), you can continue your retinol usage safely. I find it a waste of time and money to use retinol and still sunbathe. If you sunbathe, you’ll still get wrinkles and pigmentation no matter how good your skincare is.” The best sun protection is something that feels comfortable, is easy to apply and doesn’t irritate. Chemical sunscreens work well, but can irritate skin, and the ingredients in them may be harmful to marine life. Mineral-based products tends to be most suitable for sensitive skins, however, many leave a white cast on skin. Skinceuticals Physical Fusion UV Defense SPF50 ($46) has a slight tint that offers enough coverage to blur imperfections, and is also light and blendable. 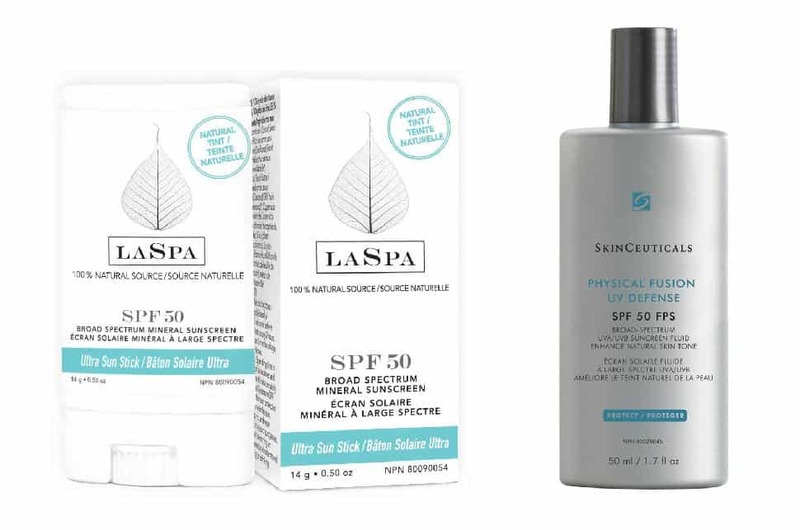 Canadian brand LaSpa has just launched Ultra Sun Protection Stick ($18), an all-natural SPF50 sunscreen that comes in stick form, so it’s mess-free and easy for on-the-go touch-ups, especially on areas like the nose, where you get more sun exposure. It can be applied over or under makeup and is slightly tinted, so it evens out the skin tone and doesn’t leave you ghostly pale. If you do get burned, Smith says it’s important to cool the skin down fast. 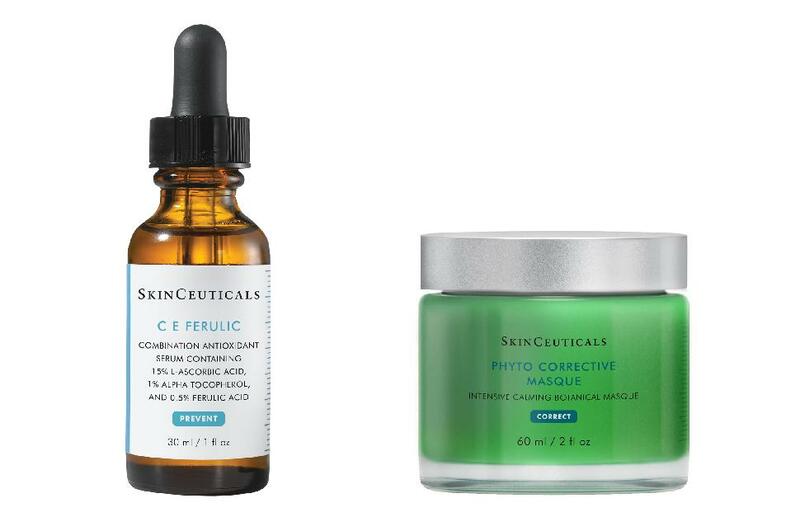 “We recommend applying Skinceuticals Phyto Corrective Masque ($70), which contains a high concentration of calming botanicals like cucumber and thyme. It’s also clinically proven to pull heat out of the skin by five degrees Fahrenheit (2.8 degrees Celsius),” she says. To reduce damage even further, you can apply an antioxidant vitamin C serum such as Skinceuticals CE Ferulic ($175), which Smith says helps reduce sunburn cell formation. and an intensive moisturizer. It’s easier to look groomed if your brows are tidy. “In preparation for any beach vacation, getting the brows waxed and tinted will ensure they look their best with minimal maintenance. The shape will be fresh for every selfie in the sand and the tint will save many minutes every morning,” says Maddox Lu, Benefit Canada national brow artist. His advice is to do this a couple of days before your trip because freshly waxed brows can be sun sensitive. Also, lay off the scrubs and peels before and after waxing. “Exfoliation can thin the skin making it more sensitive during waxing services,” he says. A wax and tint at Benefit’s Sephora Brow Bar costs $37 and can be booked online. On vacation, Lu says a brow pencil such as Goof Proof Brow Pencil ($32) and a clear brow gel like 24 Hour Brow Setter ($32) are essential. If you’re a newbie to waxing, some serious ahead-of-time planning may be required—the experts at Stripped Wax Bar recommend coming in for a wax four to six weeks before your vacation to ensure there are no unexpected reactions. If it’s all good, you can book your pre-holiday hair removal a couple of days before you go away, though hair has to be at least a quarter-inch long. Skip workouts, hot baths and steams for a day before and after the appointment because that can make skin more prone to irritation. A leg wax at Stripped starts at $44 or lower, while bikinis start at $30 (check here for full price list). The brand has also just launched some after-care products made in Vancouver. The Bare Basics Waxing Kit ($40) includes calming cream, an ingrown hair treatment and an exfoliating washcloth. Allison KuhlFor those who like to start vacation with a tan, the only safe way is with spray tan or self tanner (seriously). There are dozens of self-tanners at every price point. Burned by bad orange-tan experiences in the past? Jergens has some hot tips. The brand has a number of options depending on your timeline. Natural Glow Instant Sun Sunless Tanning Mousse ($13.99, at select drug and mass retailers) dries in 60 seconds and the colour develops over four hours. There are also the Natural Glow Gradual and 3 Days to Glow ranges, where you apply every day for a week, or for three days so you can really control the level of tan. The brand has just launched an Ultra Deep Bronze version of the Sunless Tanning Mousse, but how do you know which shade to choose? “It all comes down to personal preference,” says the Jergens spokesperson. “We recommend selecting one shade darker than your natural skintone—for example, Light Bronze would be best suited for fair tones. However, the time of year may also affect this—for example if you have a tan already.” What’s important to remember? Self tanner won’t give you any protection from the sun, so you’ll still need to apply your sunscreen and avoid strong sunlight. A gel polish, such as CND Shellac can last two weeks or more, so it’s a fuss-free way to stay looking groomed for your whole vacation. That said, removing it can be a bit of a hassle, so you need to make sure you pick a shade you can live with. “Think about colour choices before your salon appointment and be sure the choice complements your look and style,” says CND educator Jennifer Mather. 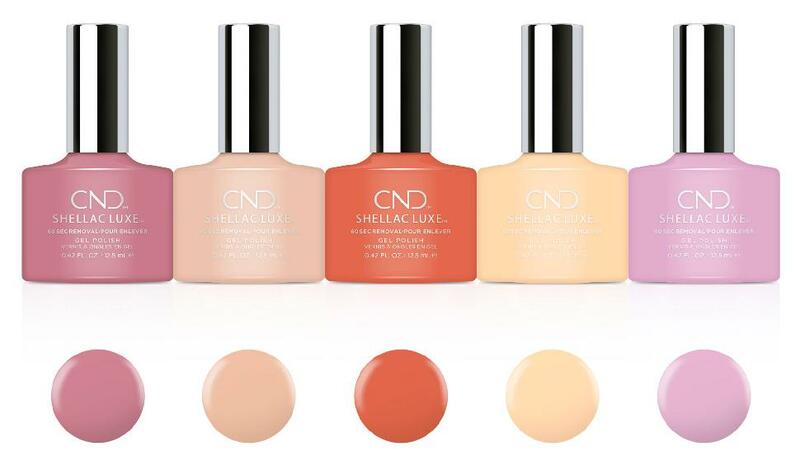 The brand’s latest Sweet Escape range comprises cool and neutral pastels, so there’s something for every skin tone, but if none of those suit, CND’s regular collection includes more than 150 shades. In case of emergencies, Mather suggests packing a survival kit including CND SolarOil Pen (a cuticle oil), a file, topcoat, and the colour of your manicure for a touchup. Pro tip: “Sunscreen can dull the shine of a polish so avoid applying it directly to nails,” says Mather. Find your CND salon here—prices vary.